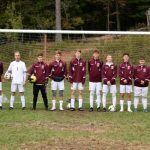 The Soccer team will face Seton LaSalle in the final home game of the season Tuesday October 16, 2018 at 7pm. The team does not have any Seniors this year. Come out and support the Trojans! Boys Varsity Soccer · Oct 4 Soccer game vs. Seton LaSalle has been cancelled for 10-4-18. Game has been rescheduled for 10-16-18 at 7pm. The Soccer game scheduled for tonight vs. Seton LaSalle has been cancelled and will be rescheduled for 10-16-18 at 7pm at Trojan Stadium. The game at Yough on 10/16/18 will be rescheduled at a later date. 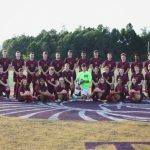 The Varsity soccer team will have their home opener Tuesday Sepetmber 4 at 7pm at Trojan Stadium vs. Bentworth. Tickets at the gate will be $5 for adults and $2 for students. Come out and support the team! The Mon Valley Independent and Bee Graphix announced their Fab 15 Soccer team. Congratulations to Noah Keene, Brendan Sheehan, Tyler Kubala, and Faith Keene for being named honorable mention. Click here to read the article.